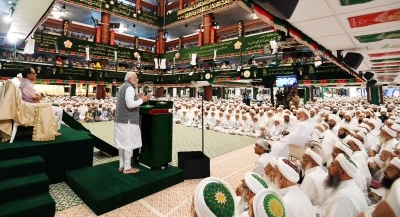 Indore Sep 14 (IANS) In an outreach to the Dawoodi Bohra community a Shia sect of Muslims Prime Minister Narendra Modi on Friday said India treats the world as family and takes everyone along which distinguishes it from other countries. Speaking at Ashara Mubaraka -- Commemoration of the Martyrdom of Imam Husain -- organized by the Dawoodi Bohra community at the Saifee Mosque here he praised the community for its honesty and said it has always played a key role in India s progress and growth story. "We are people who treat the world as a family and follow the tradition of taking every one along. This is the strength of our society our heritage that distinguishes us from other countries " Modi said. Remembering the sacrifices of Imam Husain the prime minister said the Imam always stood against injustice and attained martyrdom for peace. Modi said the Bohra community had imbibed the message of Imam Hussain and taken it to the world and his message has a greater relevance in today s world. Appreciating the work done by Syedna Mufaddal Saifuddin the head of the Bohra community which has a good number of business people Modi said love and dedication towards the nation are hallmarks of his teachings. "The businessmen and traders are the backbone of economy. They are an important unit to produce employment. They are being encouraged to the extent possible. But this is also true that all five fingers are not alike. There are people in society who treat dishonesty as business " Modi said. "In the last four years the government has succeeded in giving a clear message that all activities should take place within the rules. The honest businessmen are being encouraged through GST Insolvency and Bankruptcy code " Modi added. He said India is the fastest growing economy among the major economies and is seeking to achieve a double digit growth rate now. "And the way we are progressing the country can achieve it despite the challenges before us." The Prime Minister said that the kind of esteem India had in the past "we have the opportunity to get the same respect for New India." "We have pride on the past faith on the present and self-confidence of a bright future. We will keep marching together for rebuilding the country " he said. "It is my good fortune that I have always got your affection. There will probably be no village in Gujarat which does not have a businessman from the Bohra community. When I was chief minister they gave me support at every step. Your warmth has brought me here " Modi said. He said the Bohra community had helped the Gujarat government cope with the water problem and malnutrition and had built 11 000 houses for the poor. Noting that the Swachhata Hi Seva Movement will begin on Friday Modi said he will interact through video conferencing with every section including religious leaders artists entrepreneurs and citizens. Referring to Ayushman Bharat which will be launched on September 25 Modi said it has come like a "sanjeevni (lifeline)" for 50 crore poor people in the country and was in a trial phase at present. Referring to Indore he said the city was the leader in the cleanliness drive and Bhopal has also done good work in the area. "The youth in entire Madhya Pradesh are giving speed to this campaign."